The pressure to succeed in New York is enormous as there’s no tougher market for pro athletes to gain acceptance from the local fanbase. Derek Jeter, Carmelo Anthony and Eli Manning have all reached the pinnacle in their own sport while playing in New York. 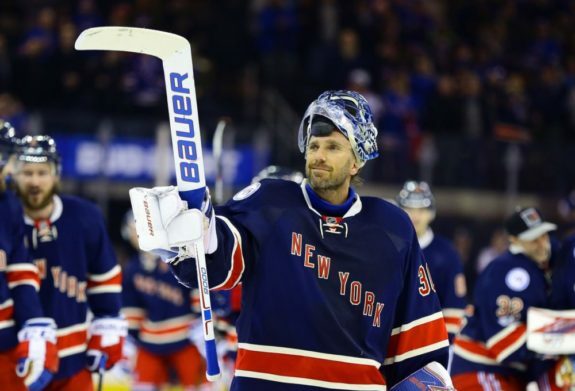 Henrik Lundqvist is the last of this breed, and the King still reigns despite the fact the New York Rangers are under the midst of a massive rebuild. His competitive fire is what attracts the masses, just watch Lundqvist’s approach in defending the crease. Too often, his talent level has covered up the Rangers shortcomings on the ice as Lundqvist has been a magician in the net for over a decade. New Yorkers applaud the fight in their star athletes, especially when the odds are clearly against them. It’s part of the DNA to expect greatness from them nightly, and no one casts a bigger shadow over Gotham than Lundqvist, but that cannot last forever. The Rangers are transitioning into becoming a fast skating, quick-passing team, but they continue to have trouble clearing the puck out of their own zone on most nights. This deficiency can be contributed to the inexperience found on the roster, but someone must take up the slack or the Rangers will sink further to the bottom of the Eastern Conference standings. No veteran on the current roster is more important to the rebuild than Lundqvist because he can lead by example and mentor young stars like Filip Chytil and Lias Andersson into far exceeding their potential. Lundqvist exhibits the perfect balance of focus and preparation that aids him to perform well in big games. Yes, he has given up the occasional “soft” goal, but his will to win is rarely wavered in a moment of dispair. Words like “quit” or “defeat” aren’t in his vocabulary. His actions on the ice confirms that hardwork and determination gets favorable results. Before the youngsters can hit their stride, they must define and excel in their roles first. Once this is accomplished, then contending for a Stanley Cup might be within the grasp for the Rangers. How long the process takes is depended upon the guidance and development provided. It’s not out of the realm of possibility to believe that Lundqvist is easily the greatest home-grown talent to ever play in the franchise’s illustrious history. Each night that he’s between the pipes, the chant of “Hen-rik, Hen-rik” rings throughout Madison Square Garden after another one of his spectacular performances. He is a great underdog story who was drafted in the seventh round of the 2000 NHL Entry Draft. Lundqvist hasn’t shown any “wear-and-tear” that is often associated with the goaltender position. Selfishly, I wish his career was more decorated, but a certain goaltender across the river named Brodeur is largely responsible for that, but you cannot argue with greatness. Over the years, Lundqvist has made some history of his own as he became the first goaltender to record at least 20 wins in the first 13 seasons of a NHL career. Also, Lundqvist achieved seven consecutive (2009-10-2015-16) seasons of finishing with at least a .920 save percentage or higher, and his lone Vezina Trophy came in 2012, which was wrapped around Brodeur’s four Vezina wins. 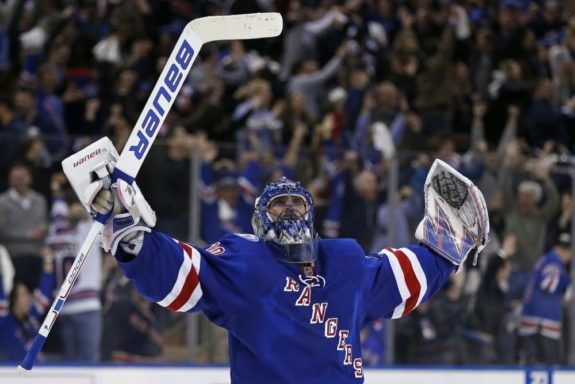 Lundqvist captured the heart of Ranger fans by leading them to the Stanley Cup playoffs in 11 of his 13 seasons in New York. In true competitor fashion, Lundqvist has no time to gloat over the accomplishments, maybe after he retires, until then, it’s all about preparing for the next opponent. The front office has done a terrific job of surrounding Lundqvist with quality talent that took them to the next level. The Rangers have been one of the dominant teams in the Eastern Conference since the 2011-12 season. They have won the President’s Trophy, a Stanley Cup appearance, two division titles and amassed 269 regular season wins for their effort. It’s a pretty fair resume without achieving the crown jewel of the sport. The pain would have been softened if the Rangers could have hoisted the Stanley Cup once during those years of dominance. For Lundqvist, hockey is still a game as much as a business. His dominance is a classic example of endurance, perseverance and possessing a high-skill level. At times, Lundqvist seems to be standing on his head trying to keep the puck from hitting the back of the net. He loves being sprawled out out on all fours protecting the crease. The fans go crazy when Lundqvist head-butts an oncoming shot away as it’s all in a night’s work. Arguably, he’s still one of the most skilled goaltenders in the NHL today. No Ranger fan can imagine the King not being in net, but age does catch up with every professional athlete. However, Lundqvist is one of those rare superstars that could re-open the Rangers’ championship window by leading a young group back to prominence before calling it a career. It would be a fitting end to another glorious New York tale.